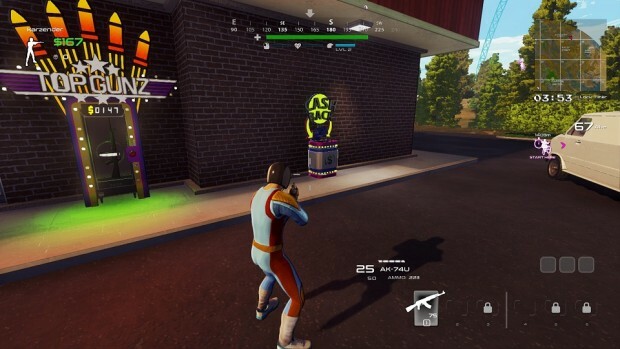 If you laughed off Radical Heights when it was first announced, I wouldn’t blame you. Whether it was the cheesy appeal to the ’80s, its instant appearance on Steam, its piling-on to the battle royale genre, or the fact that it came out while LawBreakers’ corpse was still warm, there was a lot to poke fun at. We did plenty of it in the MMOBomb Skype channel. If you’ve actually played it, you’ve seen what kind of god-awful rough state it’s in, even for an early access game. If it’s not the bugs or the lack of a female character, it’s the unfinished buildings, some without textures and furniture. It’s a hot, hot pink mess. It’s also fun, and I keep wanting to play it. 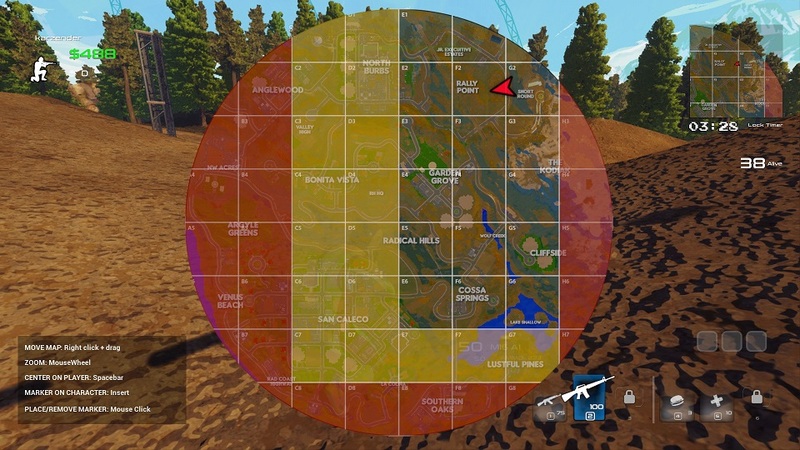 As someone who usually hates early access games and has never been head-over-heels in love with the battle royale genre, I find that mystifying. So I thought I’d try and quantify exactly what it is that makes Radical Heights work for me. Think of it as therapy by website. “Serious” survival games like PlayerUnknown’s Battlegrounds and H1Z1 strive for a realistic look, and that’s fine. Fortnite: Battle Royale has shown that you can create 100-person murder simulators with vivid colors and stylized graphics, and Radical Heights cranks that concept up to 11. Being a child of the ’80s probably helps me deal with it, and while it might not work for everyone, I like it. Maybe I don’t love it – that announcer guy grates on my nerves sometimes – but I do love that people are trying different conceptual approaches with BR games so they’re not all super-serious, ghillie-suit-clad, tactical survival-of-the-fittest affairs. Then again, I suppose bright magenta would make for pretty bad camo in PUBG. As Radical Heights Creative Director Zach Lowery put it, “Accessibility is the Kingdom.” “If your game isn’t accessible, players will be thrown off and never grasp the fun that exists within the gameplay.” While I feel that primarily applies to multiplayer online games, especially PvP ones, it’s a mindset that is a complete 180 from what Boss Key tried to with LawBreakers and its “Skilled AF” mentality. Even with its early access jankiness, Radical Heights feels good to play. That’s maybe a concession to “fun” at the expense of “realism” – guns probably should have more recoil – but it makes the game easy to pick up and enjoyable for all skill levels. It’s a solid foundation that can be built on, and Radical Heights needs a lot of building. We all like smacking monster-shaped pinatas and getting loot from them. That’s the basis of online gaming. Aside from the other players, who can be pretty monstrous, there are no actual monsters in Radical Heights. But you do have inanimate objects to smash and grab cash from, as well as random prize objects lying around that you can swipe. It gives you a sense of making progress, even if you’re not shooting anyone, and gives you something to look for even if you’re already decked out in the best gear. The usage of that cash is something I’m still on the fence about. I haven’t had much need for the in-game vending machines, and their presence – combined with the ability to buy in-game cash with real-world money – prompted a bit of a “pay-to-win” controversy last week. At the very least, I think Boss Key should make ATMs only go one way, from your character in a match to his post-game Offshore Account. That way, they can sell game cash (and boosts) galore, which people can use to buy cosmetics, without any worries about being labeled as pay-to-win. 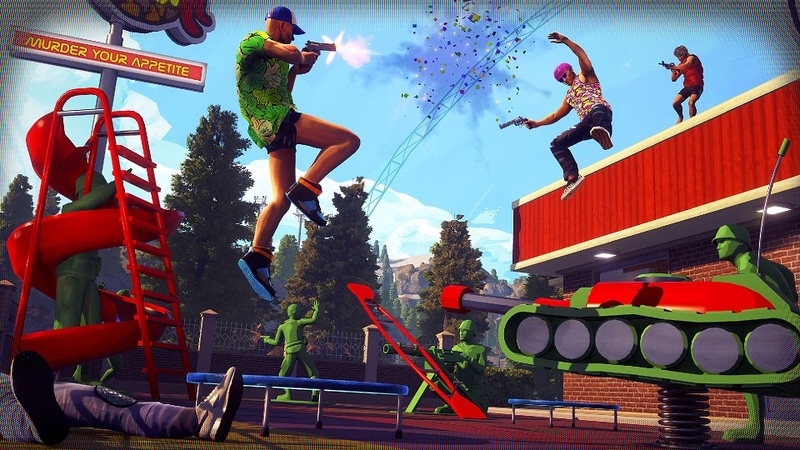 So what does Boss Key head honcho Cliff Bleszinski have to say about Radical Heights? Surprisingly little – and that’s a good thing. His cocky attitude soured a lot of people on LawBreakers before they’d even played it, and his continued public statements revealed him as someone sorely out of touch with modern games, especially free-to-play ones. Granted, when you have two-plus years to talk about your game while it’s in development, you’re going to blabber for a bit. Maybe that’s another reason why Radical Heights went from announcement to early access launch in one day. That aforementioned “interview” was with a member of the design team, not Cliffy B himself, and that was almost certainly a calculated move. Admittedly, it was more of a glorified blog post than an actual interview, but the more Bleszinski works on Radical Heights and the less he talks about it (like this) the better. “SOLID GUNPLAY’ lel weapons have no recoil. “Colorful and Brash” more like belongs to the trash!